West Chiltington & Thakeham won their first match in three games in Division 3 West last Saturday as they completed the double over Slinfold. In a game between two badly out of form sides, Chilt finally posted a competitive score, having been put in by the visitors, and defended it strongly with the ball. They hit 204-8 with returning former colt Charlie Reeves making 53 not out when opening the batting. With the ball, Slinfold’s Barbadian overseas player Kemar Small took 3-28 in a man-of-the-match performance. Reeves received good support from the middle order to ensure the home side achieved full batting points. After tea, Slinfold lost both openers in the first over to Reuben Taylor and proceeded to continue losing wickets regularly. Only Small, batting at three, stood firm with 85 not out as Chilt’s under-16 off-spinner Ben Lucking (6-48) took his third 1st XI fivefer of the season. The visitors were finally dismissed for 155. Player coach Tim van Noort, who returned to the team after an absence of a few weeks, said: “After two heavy defeats, it was important we got our young side together and reminded them that they are good enough to compete in this league. Slinfold captain Jonathan Hughes said: “From our perspective it was another disappointing result, notwithstanding the fact that as a club we had 30 playing members unavailable for selection this weekend. “Having won the toss and with arguably the better of the bowling conditions we managed to make scoring hard however we were unable to take wickets to bowl West Chiltington out as quickly as we had hoped. “Their opener carried his bat for a gritty 53 which enabled the other batsmen to bat around him especially in the middle stages of the innings. “Were able to take a flurry of wickets in the final few overs to restrict the score, but unfortunately it was too little, too late. 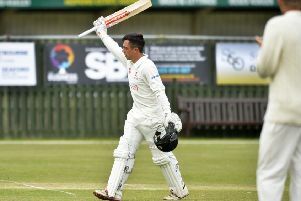 “When batting, a combination of wickets to a couple of good deliveries and some loose shots meant that no Slinfold batsman was able to show the same kind of application as the West Chiltington line-up. Chilt travel to leaders Goring on Saturday, while Slinfold are at home to Pagham.